The first couple of times Rickey answers this question are the rare moments of nuance in the otherwise informative yet formulaic 42. Rickey claims to not see white or black, but rather the green money just waiting to be harvested from African-American consumers. It might not be the most idealistic notion, but it’s a fair and realistic one. Indeed, social progress has long been a bedfellow with economic influence, whether it’s lunch counter sit-ins or LGBT boycotts. But the farther writer-director Brian Helgeland’s hagiographic home run travels, the less it focuses on any shades of gray. Ultimately, Rickey relays the injustice suffered by a black college player he once managed in the early 1900s. It’s a tale Rickey shared regularly in real life, but one that hardly explains his motivation for helping break Major League Baseball’s color barrier four decades later. As a primer on Jackie Robinson, there’s a lot to admire about 42, which spans Rickey signing Robinson to a minor league contract in August 1945 through the end of Robinson’s MLB rookie season in 1947. The majority of events in the film are drawn faithfully from historical accounts, including the infamous 1947 suspension of Dodgers’ manager Leo Durocher (Christopher Meloni) by Commissioner Happy Chandler, the petition circulated by disgruntled Dodger players to protest playing with Robinson, and even the infamous spiking of Robinson by Enos Slaughter. On the other hand, Boseman stays firmly between the lines with his performance, much like the film itself. Every episode comes affixed with a halo—racist vitriol in Cincinnati is filtered through the perspective of a little white boy torn between his dad shouting “Ni**er!” and his hero Pee Wee Reese (Lucas Black) putting his arm around Robinson on the diamond. And you’d be forgiven for thinking Robinson batted around .800 for his career, as the only circumstances that keep Robinson from ever getting a base hit are crooked umpires and the vile haranguing of Phillies manager Ben Chapman (Ben Tudyk). 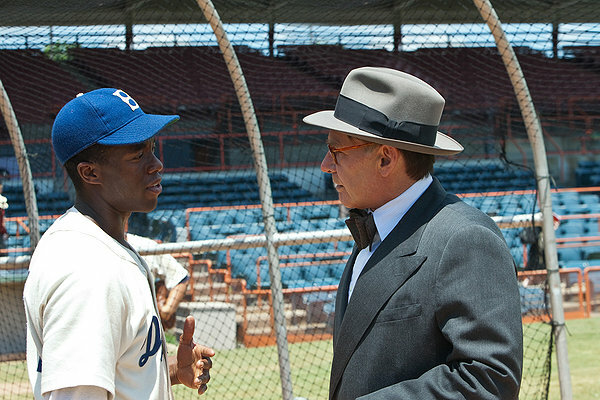 While 42 is easily digestible, it’s hard to not wonder—even during the movie—what accomplished moviemakers like Martin Scorsese, Spike Lee and even Curtis Hanson could have done with this legendary subject. This epic story deserves such epic cinematic treatment.